It started at Shupp’s Grove Bottle Show in 2010. I chanced upon a half pint bottle in a unique and unusual style, a coffin flask with an applied string lip top finish. An early Pittsburgh area example dating to 1860-70. I had never seen one quite like this before and was instantly attracted by it’s artsy angled edges, sharply contrasting the soft roundness of the applied string top. A simple bottle, yet it’s shape and style really spoke to me. Not only did I get it, but now I wanted examples in all versions of it’s sizes. Bottle collecting in color runs is the real treat for the eyes, but size runs in unique styles can be fun too. After deciding I wanted more examples like this one, I realized that they aren’t that easily had. Not rare, but definitely scarce. 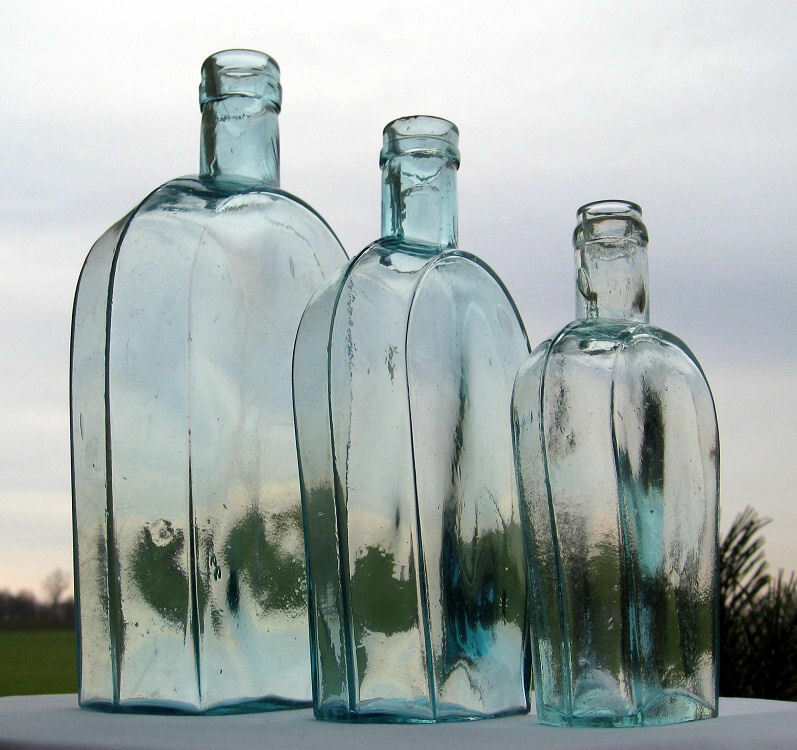 Most coffin flasks found are not aqua, but clear. They’re usually embossed with company names and feature many different later applied top styles that I found missed the appeal of the early string lip version. This flask I was now chasing was the earliest example type, the first of this style made. It wasn’t until almost a year later that I saw an identical full pint size on eBay and secured that one. A bit of time had passed. Some water under the bridge, but so far, so good. Now, what does it take to find the largest example, a full quart size identical to the two smaller versions? Impossible patience, time squared, and a little lucky fishing. Another year went by. One night found me perusing bottles offered on eBay, looking by pictures. I saw something very familiar. 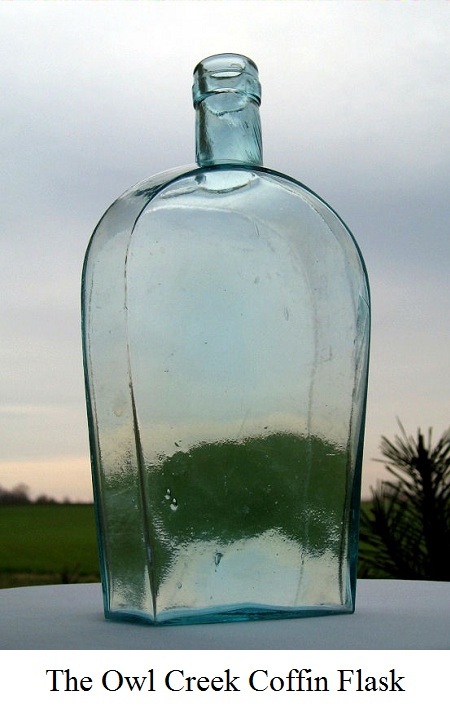 I clicked on: “Old Antique Aqua Bottle.” There it was, standing in a semi-dark picture. It was extremely inexpensive and ignored, and I was the one and only bidder and winner. As it turned out, I got more than I bargained for. Unpacking it, I was quite surprised to find a folded paper inserted into the bottle with a cleverly attached tab to easily slide it out. 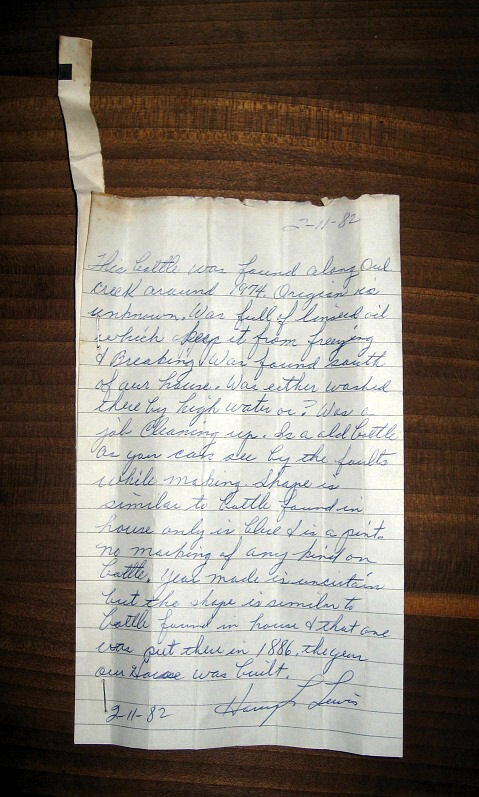 Was it a message in a bottle? A story? A treasure map? Wow. Not only did I now have my size run completed, but the history of the finding of the bottle as well. 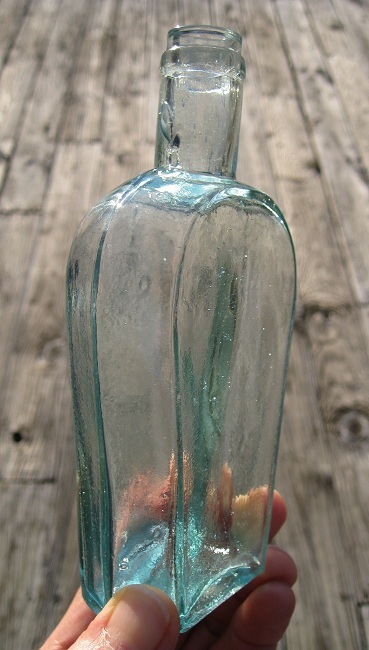 The Owl Creek the seller’s grandfather referred to, where the bottle was found, was in Missouri. The name of the creek instantly struck a chord with me. I found myself no longer thinking about how much soap it took to clean the linseed oil out of the bottle; I was thinking of one of my favorite short stories, An Occurrence at Owl Creek Bridge, by Ambrose Bierce. I read the story many years ago, amongst his many other writings. Bierce became a writer after serving the Union in the Civil War and wrote of his experiences at Shiloh. He was also well known for satire and horror stories. He was born in 1842 and wrote An Occurrence at Owl Creek Bridge in 1890. It’s rumored and left to conjecture, that, at age 71 in 1913, Bierce went off into Mexico. He supposedly travelled with Pancho Villa’s army and was never heard from again. 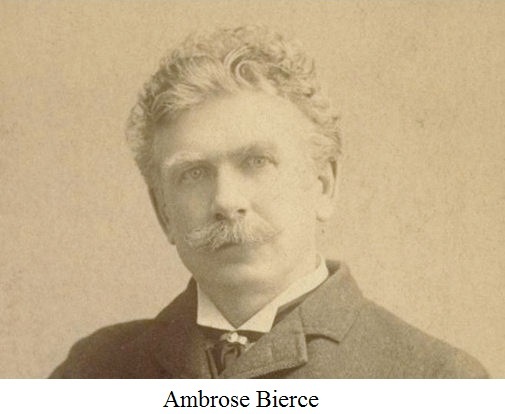 Ambrose Bierce’s fate is as big a mystery as any good story. 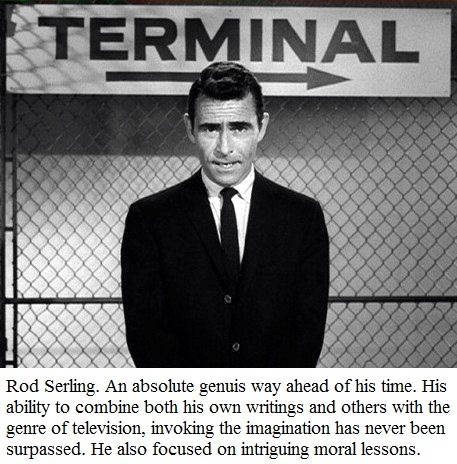 Not only did Bierce, a look alike and darker style writer version of Mark Twain cross my mind, how could I not forget the most fantastic television host and writer ever: Rod Serling? 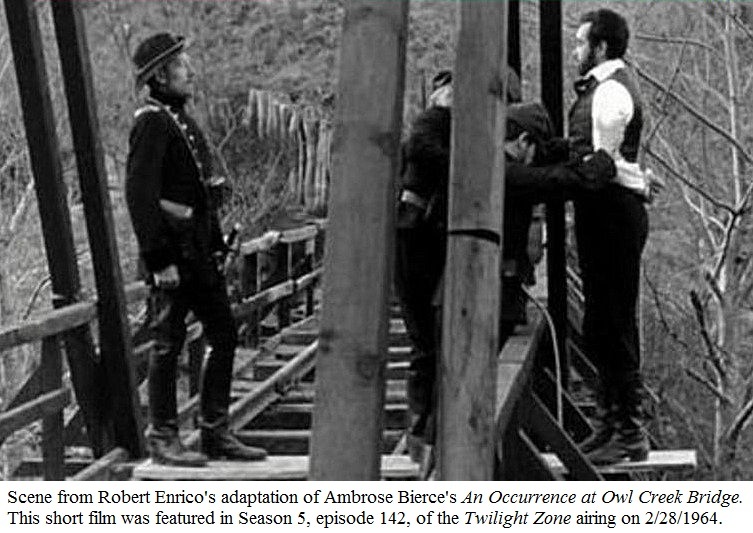 He featured Robert Enrico’s 1962 adaptation film of An Occurrence at Owl Creek Bridge-First Place Winner, Cannes Film Festival 1962 and Oscar Winner, 1964 for Best Short Subject-on his show The Twilight Zone, which aired the film as an episode in 1964. 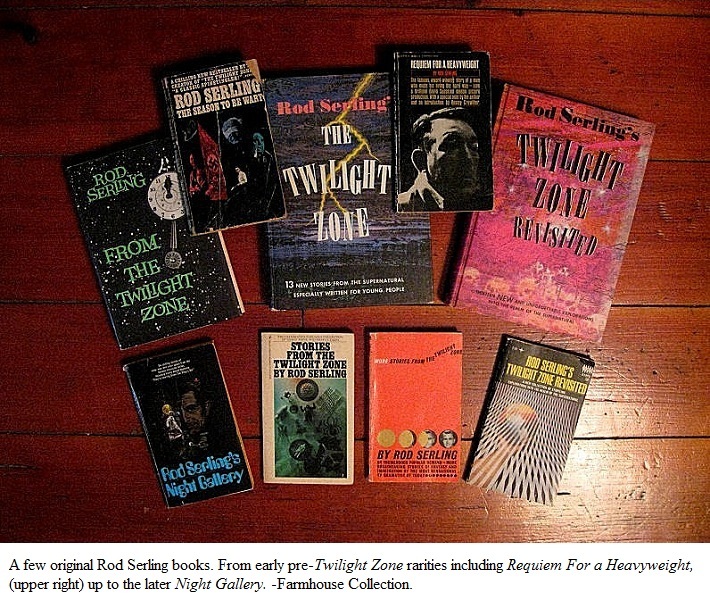 Not only am I reminded of a gifted host and imaginative writing legend, I’m now re-interested in my collection of his books. 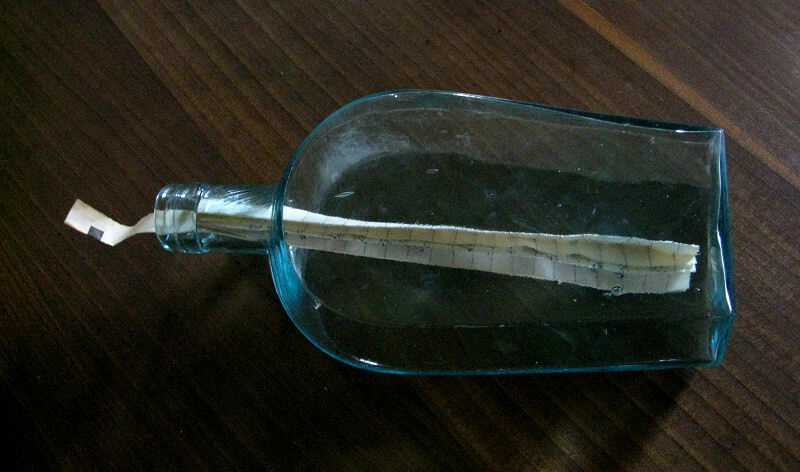 I am amazed that such a cool, unexpected “Message in a Bottle” was able to take me to so many places simultaneously. Not only to places I’ve never been, but also to places that needed an appreciative revisit. This is what collecting is all about. It’s really great having a scarce old bottle. It’s even better travelling everywhere it takes your mind. Crossing unpredictable bridges. Some leading to new places. Some leading back to old familiar neighborhoods. Where old friends are.